You don’t need to be in the automotive to transport industry to get the most out of promotional car accessories – these are a great choice for any business and with the large range of choice available at EzyPromos, you won’t be stuck for ideas. Car accessories make great promotional tools – your brand will be seen regularly if not everyday. From air fresheners to tyre gauges, there’s certainly something for every business. Branded Air Fresheners or car deodorisers are often a budget friendly way to promote your brand to your customers and clients. Useful as promotional giveaways or branded merchandise, choose the standard car design or create your own design. Have a chat with our team about fragrance options. Car Chargers are another great way to promote your brand, and these are great items to give as gifts to new clients when they first start using your business. With over 10 options to choose from, with a bright logo and the right car charger, your business name is going to be in front of your clients daily. Promotional Chamois are perfect for businesses within the auto industry to help market your brand. These chamois are a great idea as promotional merchandise, or to give away to customers when they have their car serviced with your or spend over a specified amount. With four different options to choose from, you’ll end up with a bright branded chamois to help market your brand. Sun Shades are another great way to promote your brand, whether you use them yourself as a marketing tool, or sell them as merchandise to your customers and clients. 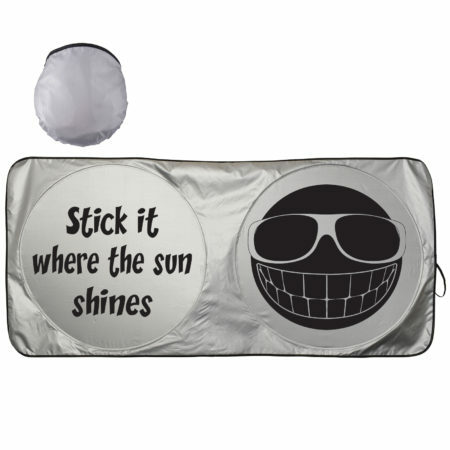 Ezypromo’s sun shade range offers bright colours to help market your brand to a wider audience. When you consider how much time people spend in their cars travelling to and from work, between job sites or just running their daily errands, using car accessories as a promotional tool simply makes sense!